The constellations best seen in November are Andromeda, Cassiopeia, Cepheus, Cetus, Hydrus, Phoenix, Pisces, Sculptor and Tucana. Cepheus, Cassiopeia, Andromeda and Pisces are northern constellations, while Cetus, Sculptor, Phoenix, Tucana and Hydrus are located in the southern celestial hemisphere. 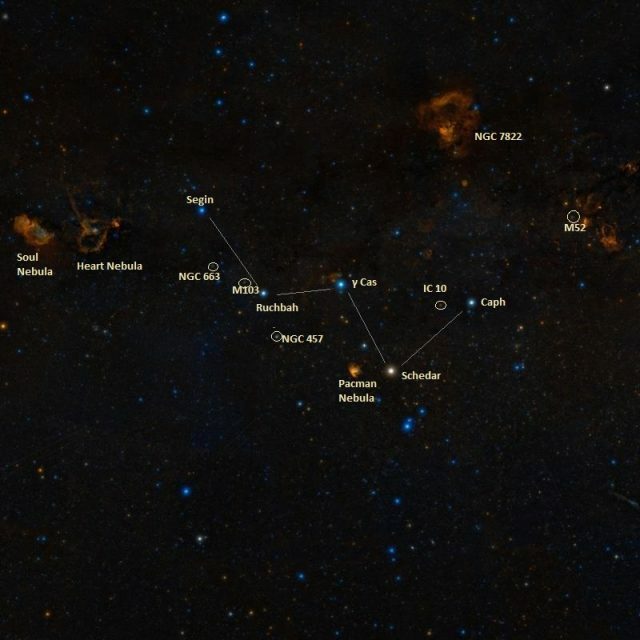 November is the best time of year to observe a great number of famous deep sky objects that lie in these constellations. These include the Andromeda Galaxy (M31), the Fireworks Galaxy (NGC 6946), the grand design spiral galaxy Messier 74, the Wizard Nebula (NGC 7380), the Pacman Nebula (NGC 281), the Heart and Soul nebulae (IC 1805 and IC 1848), the Sculptor Galaxy (NGC 253), the Cartwheel Galaxy (PGC 2248), Robert’s Quartet of galaxies, the globular cluster 47 Tucanae and the Small Magellanic Cloud. Cepheus and Cassiopeia are circumpolar to northern observers, i.e. they never set below the horizon and can be seen throughout the year. Both are Greek constellations, catalogued by Ptolemy in the 2nd century. They represent the mythical King Cepheus and Queen Cassiopeia, the parents of Andromeda, who was chained to a rock and left to the sea monster (Cetus) to appease the gods, but rescued by Perseus, who later married her. All these constellations belong to the Perseus family. Cepheus, Cassiopeia, Andromeda and Cetus are among the larger constellations, 27th, 25th, 19th and 4th in size respectively, and they are quite prominent in the northern autumn sky. Cepheus, the northernmost of these constellations, occupies an area of 588 square degrees. With only one star brighter than 3rd magnitude, it is not an exceptionally bright constellation, but can easily be found because it is located between the brighter Cassiopeia, recognizable for its W-shape, and Cygnus, which is dominated by the prominent Northern Cross asterism. The brightest star in Cepheus is Alderamin, Alpha Cephei, a white main sequence star with an apparent magnitude of 2.5. The constellation contains several famous stars, including VV Cephei and Herschel’s Garnet Star (Mu Cephei), both of which are among the largest known stars, Beta Cephei, a prototype for the Beta Cephei variables, and Delta Cephei, a prototype for the Cepheids. Both Beta and Delta Cephei are pulsating variable stars, but the pulsations of Beta Cephei variables are driven by their unusual iron properties, while those of the Cepheids are the result of processes associated with helium. Named for its garnet red colour, the Garnet Star is a red supergiant or hypergiant approximately 2,840 light years distant from Earth. Its estimated radius is more than 1,000 times that of the Sun. VV Cephei is an eclipsing binary system composed of a red supergiant and a blue companion. The estimated radius of the supergiant is between 1,050 and 1,900 times that of the Sun. Notable deep sky objects in Cepheus include the Fireworks Galaxy (NGC 6946), a spiral galaxy on the border with Cygnus in which ten supernovae have been detected in the last century (hence the name), the Wizard Nebula (NGC 7380) and the Iris Nebula (NGC 7023), two bright nebulae with open clusters, the star-forming region NGC 7822, the nebula NGC 7538, home to the largest protostar known, the Cave Nebula (Sh2-155), a diffuse star-forming nebula, the planetary nebula NGC 7354, and NGC 188, the nearest open cluster to the north celestial pole. 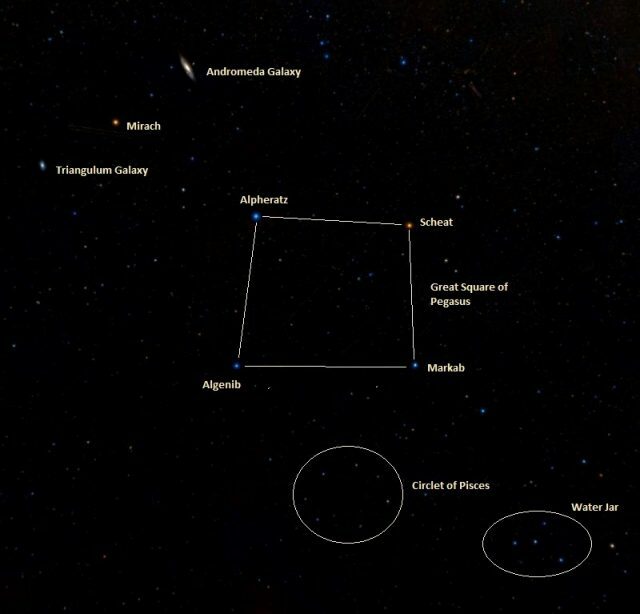 Cassiopeia’s distinctive W asterism makes the constellation one of the easiest to identify and serves as a guide to finding a number of bright deep sky objects. These include the open clusters Messier 52, Messier 103, NGC 457 (the E.T Cluster) and NGC 663, the supernova remnants Cassiopeia A, the strongest radio source in the sky, and Tycho’s Supernova, the irregular galaxy IC 10, the only known starburst galaxy in the Local Group, the Pacman Nebula (NGC 281), a large star-forming region named for its shape, and the famous Heart Nebula (IC 1805) and Soul Nebula (NGC 1848), a pair of neighbouring emission nebulae. The five bright stars that form the W are Epsilon, Delta, Gamma, Alpha and Beta Cassiopeiae. The orange giant Alpha Cassiopeiae, known by the proper name Schedar, is usually the constellation’s brightest star at magnitude 2.2, but it is often outshone by the eruptive variable star Gamma Cassiopeiae, which sometimes brightens to magnitude 1.6. 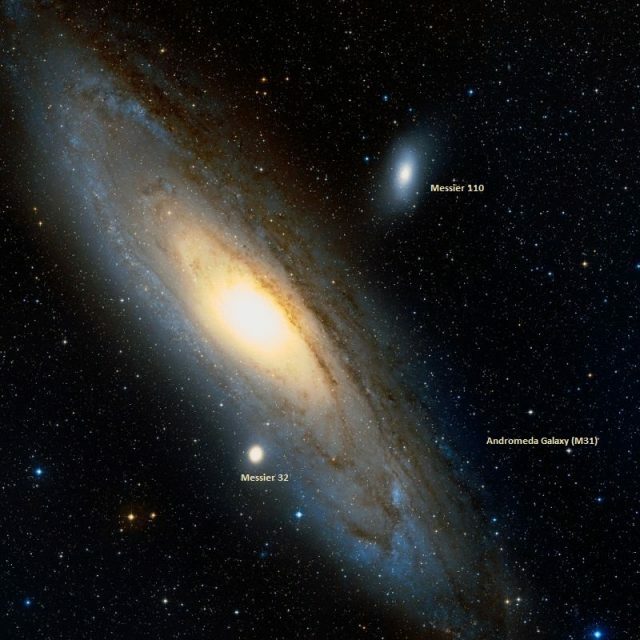 Andromeda is one of the best known constellations in the sky, mainly for hosting the Andromeda Galaxy (Messier 31), the Milky Way’s largest neighbour. The constellation is easy to identify because its three brightest stars – Alpheratz (Alpha Andromedae), Mirach (Beta Andromedae) and Almach (Gamma-1 Andromedae) – form a chain that extends from the Great Square of Pegasus, formed by Alpheratz with three bright stars in the Pegasus constellation, in the direction of Perseus, under Cassiopeia’s W.
Alpheratz is the constellation’s brightest star at magnitude 2.06. It is a binary star system composed of a B-type subgiant and a white main sequence star in close orbit. Mirach, a red giant classified as a semi-regular variable, is occasionally the brightest star in Andromeda, as its brightness varies from magnitude 2.01 to 2.10. The star is very well known to stargazers because it is used to find the Andromeda Galaxy. Almach, the third brightest star in the constellation, has an apparent magnitude of 2.10. It is a quadruple star system that consists of an orange bright giant and a fainter triple star. The Andromeda Galaxy (M31) is one of the most distant objects visible to the unaided eye. It is located at a distance of 2.54 million light years and has an apparent magnitude of 3.44. In binoculars, it appears as a small cloud. It can be found 8 degrees northwest of Mirach. The two other Messier objects in Andromeda – the dwarf galaxies Messier 32 and Messier 110 – are Andromeda’s companions. Other interesting deep sky objects in the constellations include NGC 206, the brightest star cloud in the Andromeda Galaxy and one of the largest stellar nurseries in the Local Group, Mayall II, the brightest globular cluster in the Local Group, also located in M31, the bright open clusters NGC 752 and NGC 7686, the edge-on spiral galaxy NGC 891, the interacting galaxies NGC 90 and NGC 93, the galaxy cluster known as the NGC 68 Group, and the planetary nebula NGC 7662, also known as the Blue Snowball Nebula. Pisces constellation, which lies between Andromeda, Pegasus and Cetus, is the 14th constellation in size with an area of 889 square degrees. Its brightest star, Eta Piscium (Kullat Nunu), has a visual magnitude of 3.62, which means that the constellation is not particularly conspicuous. However, it is easy to identify on a clear night because several of its bright stars form an asterism called the Circlet of Pisces, which represents the head of the western fish. The asterism can be seen under the Great Square of Pegasus, near the Water Jar asterism in Aquarius. 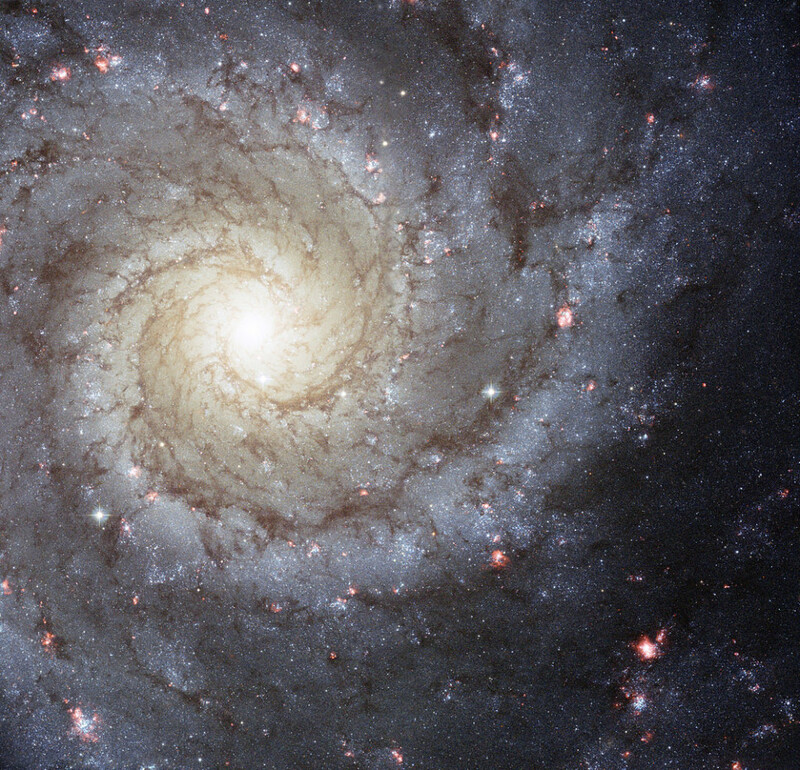 Pisces is home to the face-on spiral galaxy Messier 74, which lies about 1.5 degrees northwest of Eta Piscium. The galaxy has an apparent magnitude of 10 and is an excellent example of a grand design spiral galaxy, with well-defined spiral arms that extend clearly around it. It is the brightest member of the M74 Group, a group of 5 to 7 galaxies. Pisces also contains CL 0024+1654, a massive cluster of galaxies that consists mostly of yellow elliptical and spiral galaxies. The cluster is a gravitational lens for a galaxy in the background, which appears as an arc-shaped blue smudge in images in multiple places. Other notable deep sky objects in the constellation include the large elliptical galaxy NGC 474, notable for its tidal tails, the spiral galaxy NGC 488, and the interacting pairs catalogued as NGC 520 and Arp 284. Cetus, the Whale, is the fourth largest constellation in the sky. It occupies an area of 1231 square degrees and can be seen from every place on Earth except those located north of latitude 70°N. The constellation’s brightest star is Diphda (Beta Ceti), also known as Deneb Kaitos, an orange giant with a visual magnitude of 2.02. The second brightest star, Menkar (Alpha Ceti) is a magnitude 2.53 red giant. The third brightest and probably most famous star in Cetus is Mira (Omicron Ceti), the first variable star to be discovered. Mira is a binary system consisting of a red giant classified as a pulsating variable and a fainter white dwarf companion. The star’s name, which means “wonderful” or “astonishing,” refers to its dramatic changes in size and brightness. Its brightness varies from magnitude 2.0 to 10.1 over short, irregular periods. Mira is a prototype for a category of stars known as the Mira variables. There are about 6,000 to 7,000 known stars that belong to this class. Cetus is home to a number of interesting deep sky objects. The brightest galaxy in the constellation is Messier 77, a barred spiral galaxy with an apparent magnitude of 9.6. Other galaxies in Cetus include the supergiant elliptical galaxy Holmberg 15A and the spiral galaxies NGC 247, NGC 1042, NGC 1055, NGC 1087 and NGC 15. Cetus also contains the Skull Nebula (NGC 246), a planetary nebula with a visual magnitude of 8, named for its striking appearance. 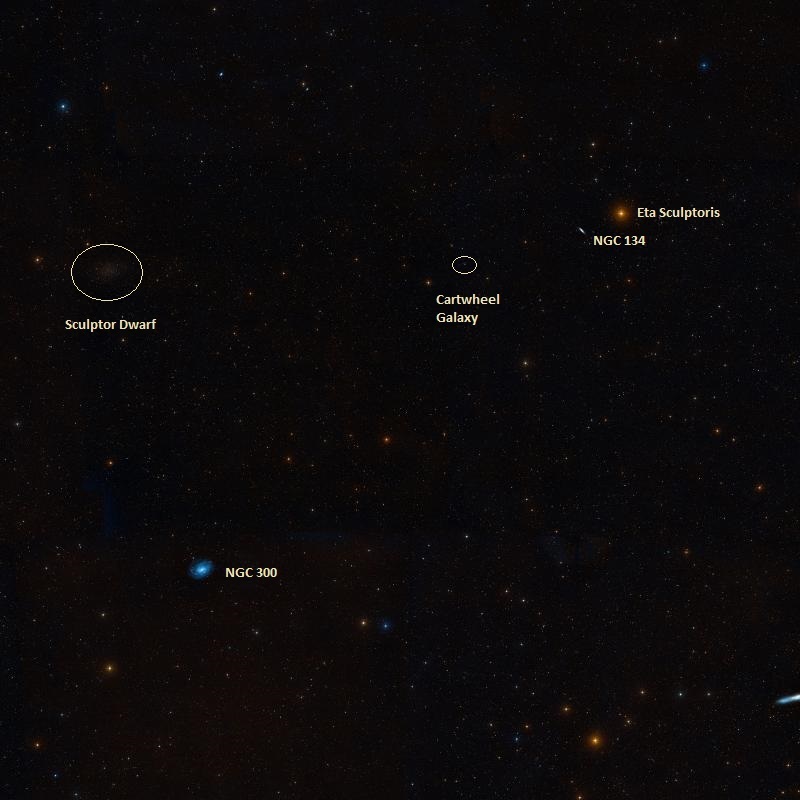 South of Cetus, the constellation Sculptor is relatively faint, with no stars brighter than magnitude 4.00. 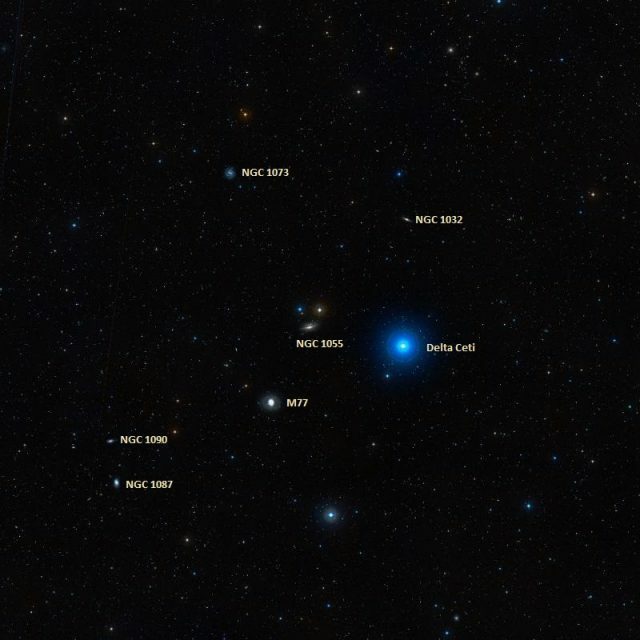 The constellation’s brightest star, Alpha Sculptoris, is a variable blue-white giant with an apparent magnitude of 4.30. Sculptor is home to the Sculptor Group, a loose group of galaxies located near the south galactic pole. The brightest member of the group is the Sculptor Galaxy (NGC 253), a magnitude 8 starburst spiral galaxy also known as the Silver Coin or Silver Dollar Galaxy. 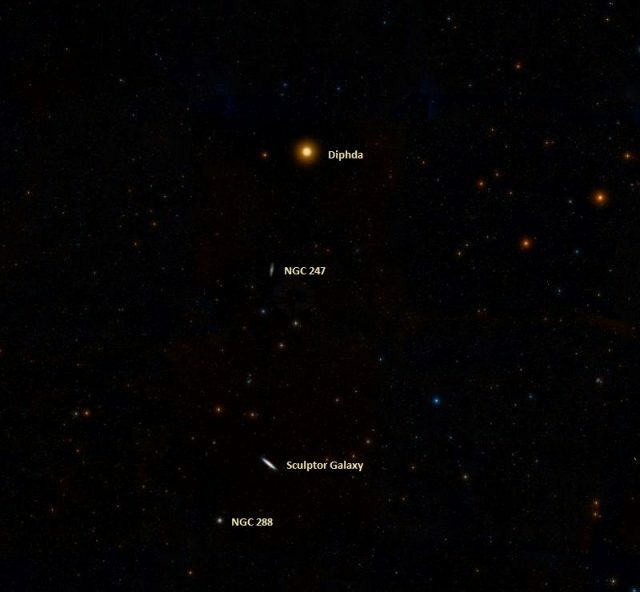 The galaxy is located near the bright star Diphda (Beta Ceti), in the same region of the sky as the spiral galaxy NGC 247 in Cetus and the globular cluster NGC 288 in Sculptor. Sculptor contains several other famous galaxies. The Sculptor Dwarf Galaxy is a magnitude 10.1 Milky Way satellite only 290,000 light years from the solar system. The Whale Galaxy or Southern Cigar Galaxy (NGC 55) is a Magellanic spiral galaxy and, at a distance of 7 million light years, one of the nearest galaxies to the Local Group, along with NGC 300, a neighbouring spiral galaxy believed to be gravitationally bound to NGC 55. The galaxies lie in the vicinity of Ankaa, the brightest star in Phoenix. 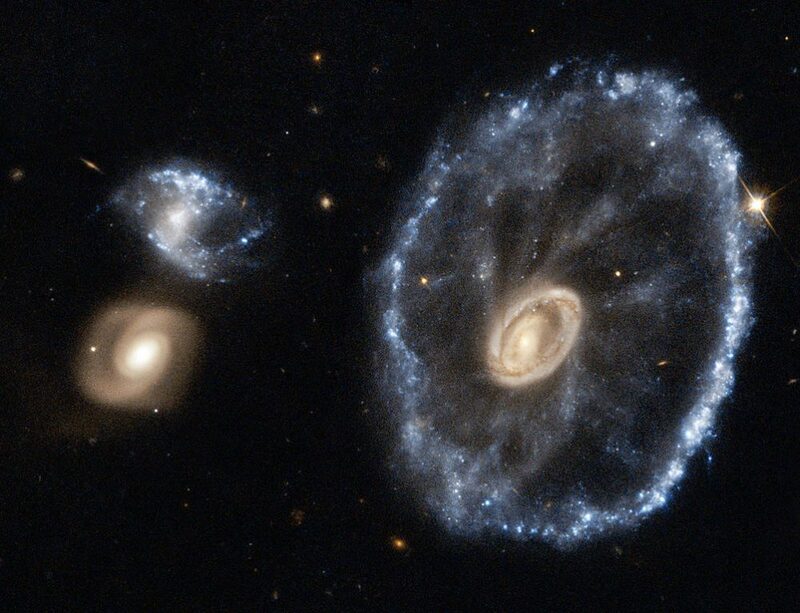 The Cartwheel Galaxy (PGC 2248) is a lenticular galaxy and ring galaxy known for its unique, unusual shape, likely the result of a collision with a smaller galaxy. It has an apparent magnitude of 15.2 and lies at an approximate distance of 500 million light years. The galaxy is located near magnitude 4.81 variable red giant star Eta Sculptoris, in the same area as the Sculptor Dwarf and the barred spiral galaxy NGC 134, nicknamed the Giant Squid Galaxy. The southern constellations Phoenix and Tucana, along with the nearby Pavo and Grus, are known as the “Southern Birds.” They are mostly invisible from mid-northern latitudes and can only be seen south of latitudes 32°N (Phoenix) and 25°N (Tucana). Named after the mythical bird, Phoenix occupies an area of 469 square degrees. Its brightest stars, Alpha and Beta Phoenicis, are easily visible, but not exceptionally bright. 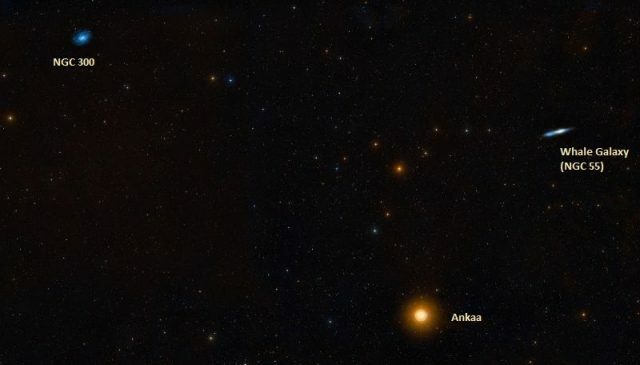 Alpha Phoenicis, known by the proper name Ankaa, is an orange giant with an apparent magnitude of 2.377. The star is really a spectroscopic binary system and it lies at a distance of 85 light years from Earth. Beta Phoenicis is a wide binary system consisting of two yellow giant stars with a combined visual magnitude of 3.3. Phoenix contains a number of interesting deep sky objects. 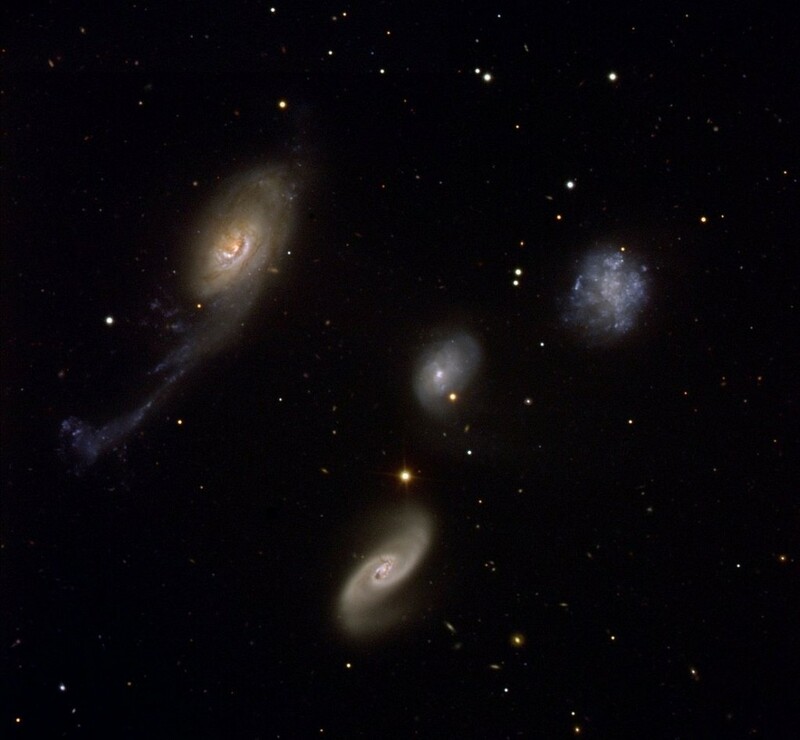 Robert’s Quartet is a compact galaxy group consisting of four galaxies – NGC 87, NGC 88, NGC 89 and NGC 92 – that are in the process of interacting and merging. The group has an apparent magnitude of 13. Other notable deep sky objects in Phoenix include the dwarf barred spiral galaxy NGC 625 (mag. 11.7), the spiral galaxies NGC 482 (mag. 13.7), NGC 98 (mag. 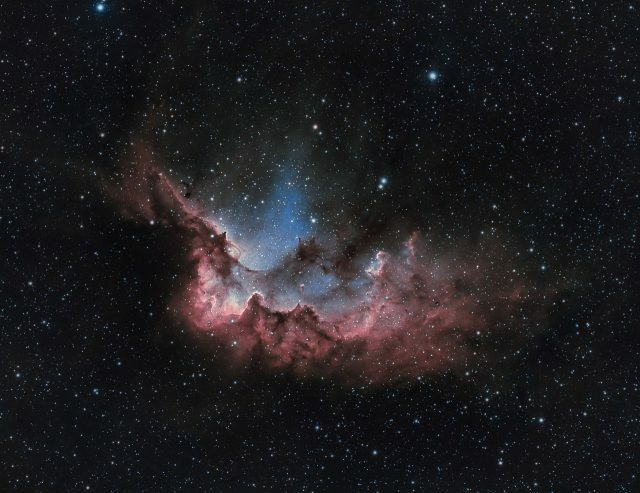 13.59) and NGC 238 (mag. 13.14), and the interacting pair catalogued as NGC 454 (mag. 13.12). Tucana is not particularly large (295 square degrees) or bright, but it is very popular with southern stargazers because it contains two bright, well-known deep sky objects: the globular cluster 47 Tucanae and most of the Small Magellanic Cloud (SMC). Tucana is located between two bright stars, Achernar (Alpha Eridani) in Eridanus and Peacock (Alpha Pavonis) in Pavo constellation. The constellation’s brightest star is Alpha Tucanae, a spectroscopic binary star with an apparent magnitude of 2.86, whose primary component is an orange giant. 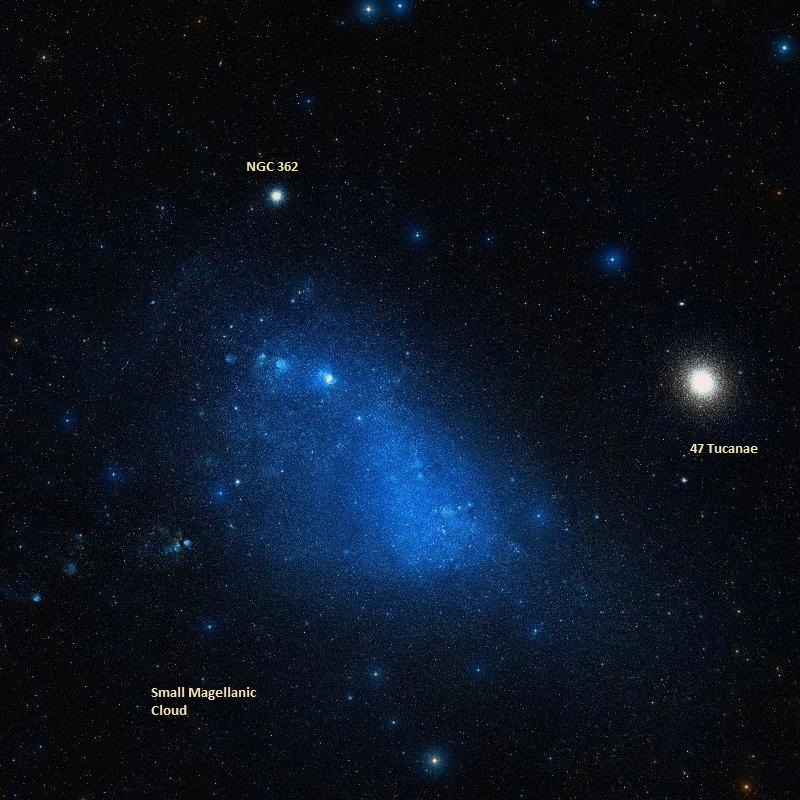 The Small Magellanic Cloud and 47 Tucanae lie in the same area of the sky and are both visible to the naked eye. The Small Magellanic Cloud is a dwarf irregular galaxy with an apparent magnitude of 2.7 and a diameter of 7,000 light years. It lies at an approximate distance of 200,000 light years and is one of the most distant objects visible without binoculars, appearing as a detached piece of the Milky Way. It is located in Tucana and Hydrus. The galaxy’s apparent size is 14 square degrees, which is 18 times the size of the full Moon. Its larger neighbour, the Large Magellanic Cloud, is located about 20 degrees to the east, in the constellations Dorado and Mensa. The two galaxies are connected by a bridge of gas, which suggests that they are gravitationally bound and interacting with each other. NGC 346 in the Small Magellanic Cloud – Hubble astronomers have uncovered, for the first time, a population of infant stars in the Milky Way satellite galaxy, the Small Magellanic Cloud (SMC, visible to the naked eye in the southern constellation Tucana), located 210,000 light-years away. 47 Tucanae is located just west of the SMC. With an apparent magnitude of 4.09, it is the second brightest globular cluster in the sky, after Omega Centauri in Centaurus constellation. In exceptionally good conditions, it appears about the size of the full Moon. A smaller globular cluster, NGC 362, lies just to the north of the SMC. It is quite bright at magnitude of 6.4, but outshone by its larger neighbour. Other notable deep sky objects in Tucana include the Tucana Dwarf, a magnitude 15.7 dwarf spheroidal galaxy, the spiral galaxy NGC 406 (mag. 13.02), the emission nebulae NGC 248 and NGC 249, and the open clusters NGC 265, NGC 290 and NGC 346, located within the Small Magellanic Cloud. There is another bright open cluster in the SMC, catalogued as NGC 602, but it lies in the neighbouring constellation Hydrus. Hydrus, the southernmost of the November constellations, is located between the two Magellanic Clouds and contains a portion of the SMC. The brightest star in the constellation, the yellow subgiant Beta Hydri, has a visual magnitude of 2.80 and is the nearest relatively bright star to the south celestial pole. Located at a distance of only 24.33 light years, it is the nearest subgiant star to the Sun. 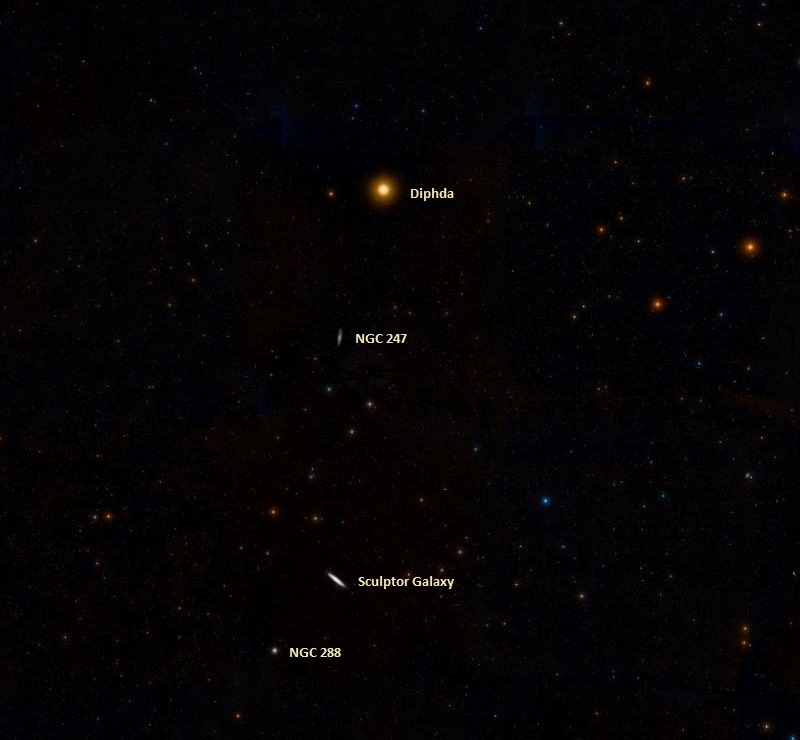 The deep sky objects in Hydrus are relatively faint. They include the globular cluster NGC 1466 (mag. 11.4), an outlying member of the Large Magellanic Cloud, the large spiral galaxy PGC 6240, also known as the White Rose Galaxy, and the open cluster NGC 643, which lies on the outskirts of the Small Magellanic Cloud.